Dr. Prachi Patil is one of the best Dentists in NIBM Road, Pune. She has been a practicing Dentist for 14 years. She studied and completed BDS . She is currently practising at Dr Prachi Patils Professional Dental Care in NIBM Road, Pune. She has received 17 delightful feedbacks from satisfied patients. Don’t wait in a queue, book an instant appointment online with Dr. Prachi Patil on Lybrate.com. Lybrate.com has a nexus of the most experienced Dentists in India. You will find Dentists with more than 39 years of experience on Lybrate.com. You can find Dentists online in Pune and from across India. View the profile of medical specialists and their reviews from other patients to make an informed decision. Even though I was fit and fine, it was shocked when I got to know that I am going to be treated with root canal. But Dr Prachi made it easy for me. The overall treatment was very quick and effective. I owe her a big thanks for making me fine again. She is really a sweet and a kind hearted doctor. I thank Dr Prachi for the root canal treatment she provided. I must say that the her professional dental clinic has all the amenities which patient requires. She is a well knowledgeable and experienced dentist and I am quite benefitted with her root canal treatment. I thank Dr Prachi for te root canal treatment he provided. I must say that her has all the amenities which patient requires. She is a well knowledgeable and experienced dentist and I am quite benefitted with her root canal treatment. I needed a tooth coloured filling for which I consultedc Dr Prachi. She has rboad knowledge in the field of dentistry. I am completely satisfied with the results. My previous experiences were not so good, but Prachi Patil has completely changed my opinion as she is very helpful and humble. Thanks to herthat the dental restoration she gave me has given brilliant results. . Many people gave very positive feedback for therPrachi Patil. In the very first sitting, Prachi Patil clearly told us the problem and the what the treatment procedure will be in future. Everything was just spick and span in the Dr Prachi Patils Professional Dental Care. I was having while eating some chilled or sweet stuff which I was finding very irritating. It was getting very difficult for me to cope us with my sensitive teeth. Someone from the office, referred us that Prachi Patil. She ensures that she listens to her patients. On the very first day she identified my problem.Her treatment suited me the best. I am thankful to her for treating me so patiently. I have consulted Dr Prachi Patil for filling traetment. I read about Dr Prachi Patil on one of the social media platform.Dr Prachi Patil has helped me in the treament. The waiting area in the Dr Prachi Patils Professional Dental Care is very comfortable for all patients. Thanks to her I am much better now. 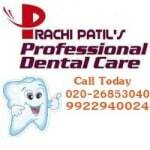 Prachi Patil is quite knowledgeable in the field of dentistry. I lost one of my front tooth and because of that I used to feel quite embarassed while talking to anyone. I consulted Dr Prachi who is a well known Dentist. She helped me alot with the missing teeth treatment. I am quite benefitted and I thank her . I am glad that I chose her as she is not only a knowledgeable dentist but also a very kind hearted person. I took dental examinations from Dr. Prachi Patil. She is not just friendly, but also is very motivating. So many doctors I consulted, but hertreatment was the best. I read about the Prachi Patil on one of the social media platform. The overall atmosphere in the Dr Prachi Patils Professional Dental Care is very soothing. Dr. Prachi clinic is clean and well equipped. She is very gentle, efficient, courteous and gives you a very honest and detailed explanation of the treatment necessary. Couldn't ask for more.